Is it just me, or are donuts making a popularity come-back? On our recent vacation to California, we noticed donut shops everywhere! The trend hasn’t exactly made it to Utah (that I’ve noticed), but I have a feeling it’s going to get here eventually. 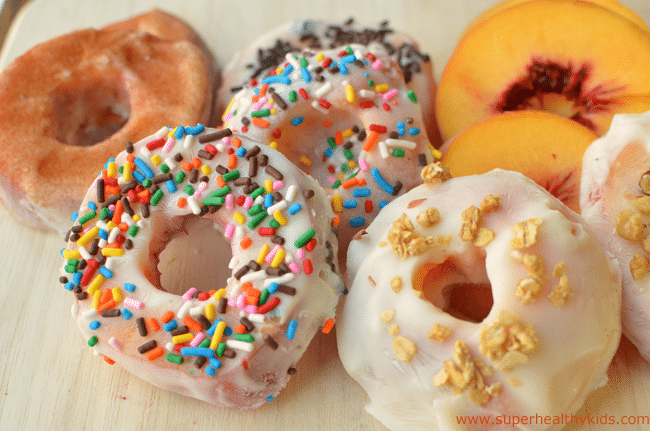 I can honestly say, donuts are one food I’m never tempted to “treat” my kids with. Cinnamon rolls, yes, but donuts… meh. They make you sick so fast! After one, don’t you feel awful? 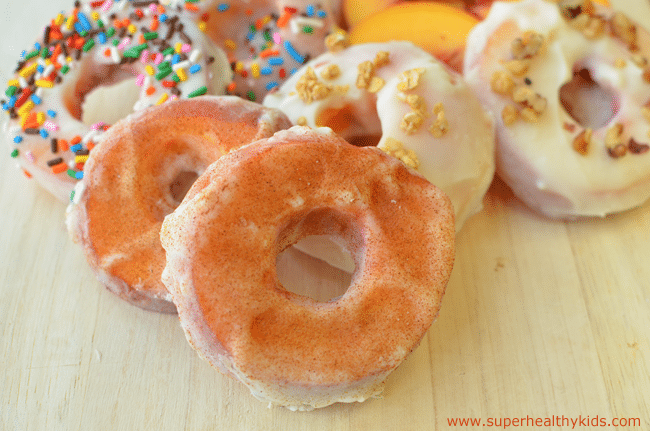 Your kids won’t feel sick after eating our REAL PEACH DONUTS however. Because they really are peaches! Vision- like carrots, peaches are full of beta-carotene that support eye health! Fiber- we like to keep our kids “regular”, and fiber is the way to do it! Vitamin C- Oranges can’t get all the credit, peaches are also a great source of vitamin C, helping kids fight infections and bugs. 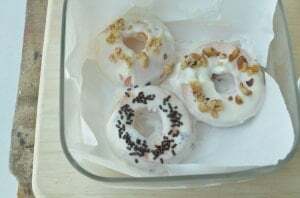 So, with all the donut talk, and me never wanting to purchase any, I decided to make a fun peach donut for our snack yesterday! It was super easy. Simply, cut peaches cross-ways, so the pit is in the center. Scoop out a little extra of the center with a melon baller to make a circle. 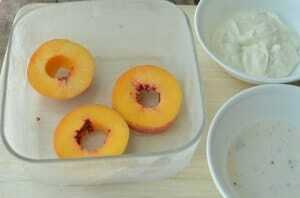 Freeze the peach rings for about 30 minutes to make it easier to dip in yogurt. 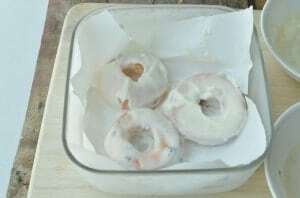 Second, lining a pan with wax paper, dip in yogurt. I used two kinds of yogurt. Plain, and a mint chocolate chip yogurt! Oh my goodness!! that tastes like mint chocolate chip ice cream! Return to freezer again until frozen! They were perfect for us after about 3 hours. Then, I had to let it sit out for about 10 minutes just to make them easy to bite through. Our favorite one- CINNAMON SUGAR!! 100%, hands down, it was delicious! Need to try this! Have you tired any other fruit? Wondering if another fruit would work as well as the peach. I haven’t, but maybe apple rings?? I tried a recipe for grapes.. freeze grapes on a baking sheet lined with wax paper. Use toothpicks to poke the stem hole and dip in yogurt of choice (I prefer organic greek yogurt and mix in a little fruit puree or stevia) then drop on sheet and freeze. They are a nice little treat. Pop one in your mouth and the yogurt starts to melt, then you get this bite of sweet grape. I got to say you are a healthy genius! Mmmm! This is such a great idea! I can’t wait to try this and see what my kids think. We love peaches but I can’t seem to find good ones yet. I’ll keep looking. We would love this! I completely agree about the donut…so not tempting and makes you feel gross after eating it. I love frozen grapes too! I just bought a fresh, whole pineapple cause my 6 yr old wanted it and was just thinking….hmmm, same shape. Might be a good recipe to try with it? What do you think? Might be tasty?? What a fun and cool idea. What could be the substitute for yogurt since it’s sunny here in ph and im going to serve it outdoor? What could be the substitute foryogurt since it’s sunny here in ph and im going to serve it outdoor? I am going to try this with coconut milk yogurt and make it Vegan! Thanks looks amazing! I was thinking of using silk yogurt. Coconut milk seems like a good idea too. How did it turn out,and did you need to change anything else? I keep seeing you use colored sprinkles, are there all natural ones available? Regular sprinkles have all sorts of nasty things in them, food coloring alone can seriously damage a developing brain and has been linked to ADD/A DID inchildren, along with rage and anger issues. We just tried this and I couldn’t get the peaches to part with pit with out them being smooshed. Can you explain how you get them to cut? Are my peaches too soft? 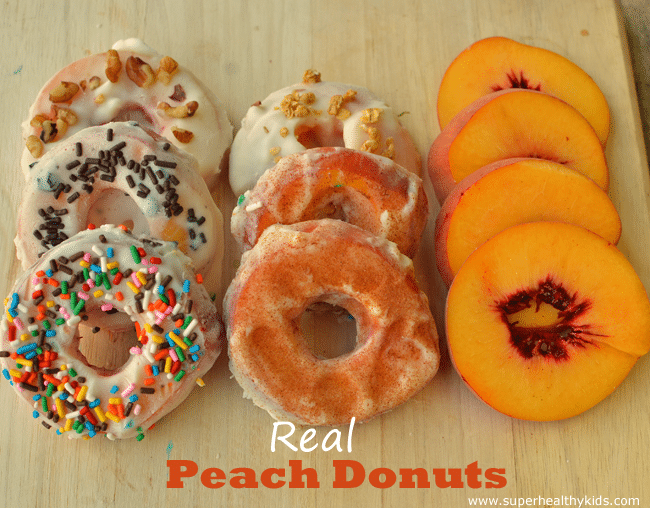 Definitely worth trying out these real peach donuts. They look so real! Eating healthy is fast becoming cool! Thanks for this idea! I love being create with my kids snacks. I freeze pieces of banana on a toothpick and then dip in yogurt and coconut. Sometimes, for a big treat, I’ll dip them in chocolate. The frozen banana really tastes like ice cream. Where did you find mint chocolate yogurt? Thanks Kourtney! I love it! where did you find the mint chocolate you yogurt? Do you know the brand by any chance? Sounds so delicious! Pretty sure it was Chobani Shannon! Great idea! This looks awesome! Can’t wait to try in the summer!